"The lack of direct immersion and the increasing rarity of actual face-to-face interactions are the true cause of our anomie . . . and our isolation in a supposedly ever-connected world." Here is another commentary on declining attention spans and our increasingly fragmented lives. 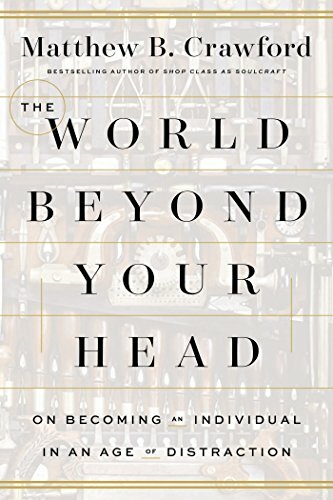 Except in The World Beyond Your Head Matthew B. Crawford argues that we complain about the wrong thing: technology is more a symptom than a cause. Attention entails more than individual minds because it has become a cultural problem. “Ours is now a highly mediated existence in which . . . we increasingly encounter the world through representations.” This disembodiment of perception, the lack of direct immersion, and the increasing rarity of actual face-to-face interactions are the true causes of our anomie, our isolation in a supposedly ever-connected world, and our sense of being overwhelmed. The result is that public surfaces become marketing billboards, from the small to the large to the inescapable: ads appear on escalator handgrips, the sides of buses, the bottom of airport security trays, even on credit card terminals during the few seconds while your charge awaits authorization. “Our attention isn’t simply ours to direct where we will.” Can’t adverts be opt-in rather than opt-out? All infant mammals develop an “orienting reflex,” an automatic turning toward any new stimulus. Because it is so fundamental we find it impossible not to look at TV monitors at airports or in waiting rooms. Corporations who have a monetary interest in seizing our attention exploit this. They steer us away from one another and toward “a manufactured reality” devised by faraway parties. The illusion of choice is the central pillar of consumer capitalism, but so many choices have already been decided for us. “Choice architects” manipulate us even at the supermarket. They negotiate for cash exactly where shelf items get placed. One hears that people should be allowed to make their own decisions, except how can they when they’re being surreptitiously manipulated nonstop? Conclaves of advertisers speak of engineered environments and attentional landscapes. There is even an industry award for “Best Use of Ambient Media,” which means whoever can sidetrack us the most. And yet it is silence, in the broad sense of not being incessantly addressed, that allows us to think. Now we have to pay for silence as a luxury good in airport clubs and private compartments away from the cacophony. Or at least shell out for a good pair of noise-cancelling headphones. Fortunately, attention is like a muscle in that practice can strengthen it and narrow its focus. But just as food conglomerates have figured out what ratios of sugar, fat, and salt make us gobble down their product, media have likewise become deft at delivering stimuli that our brains find irresistible. It takes fortitude and skill to resist these intrusions, but isn’t resistance the essence of independent thought? This autism analogy segues nicely into a fascinating chapter on the so-called gaming industry, and obsessive gambling as “addiction by design.” Players lose themselves. Video gamers and casino gamblers can persist in mindless repetition so intently that they neglect to eat or drink, overriding the survival instinct so that a number of them have died in midplay. In the same way that phones and social media capture and hold our attention longer than we intend it is “a kind of autistic pseudo–action, based on exact repetition.” Autistic individuals prefer sameness, repetition, rhythm, and routine, a similar point made by Susan Greenfield in Mind Change: How Digital Technologies Are Leaving Their Mark on Our Brains. A sense of gratification comes even if only from pushing a button, selecting from a drop-down menu, or tapping “like” on Instagram and elsewhere. Each yields high gratification for minimal effort. Each demands zero engagement. As Crawford develops his argument, the book becomes more philosophical. This may be heavy going for some readers not particularly interested in phenomenology, moral philosophy, Kant, and similar thinkers.